Text: 206-218-8201 – (Note: We won’t see texts from 10PM-7AM). In case of emergency, call 911. We try to answer our phone and texts, but are asleep at night and will not see a text until morning. » All lodge rooms and suites include: Free WIFI, HDTV with HBO, Large breakfast, Espresso Bar, Refreshments; daily maid service, Luxury linens, towels, bathrobes, toiletries, mini fridge, snacks, ice and water. » All rates are based on double occupancy – additional persons are $35.00 each. » NEW: No smoking allowed except in our designated outdoor area. » Children of any ages are welcome, with the understanding that 10pm - 7am quiet hours will be respected, out of courtesy to other guests. Children need to be chaperoned at all times. » Check in is 3:30pm-6:00pm. If arriving after 6pm, please contact us for your door code. » Check out time is 11 a.m.
» Early check in (from 12noon) and late check out (until 2pm) are available for $50.00 fee each. » No refund for early check out. If uncertain how long you would like to stay, it is better to add additional days once you are here. » We accept MasterCard, Visa, Discover, Amex, PAYPAL, and Cash. » Reservations are secured with a one night deposit and remainder due upon arrival. » If reservations are cancelled or changed more than 14 days before scheduled arrival, a $30 restocking fee and/or change fee will be charged to the credit card on file. » If cancelling less than 14 days before arrival - your card will be charged for the full amount of the reservation. If your travel plans are uncertain, we suggest you purchase travel insurance. » We are not responsible for items left behind in the rooms. We will make every attempt to find your item and ship it to you through USPS for a nominal fee. » Hot tub is available 24 hours a day! You may check in any time after 3:30pm. Check out time is 11:00am. We will text you a code for the door the morning of the day of arrival. Make sure we have your cell # for this use. Parking is available on the street for two hours between 8am-5pm. (Overnight is free as well) Long term parking is available about 2 blocks away: on the other side of the river on F street, also near Riverside park and also behind Safeway. You may park in the alley to unload if unable to find an open spot on F Street. 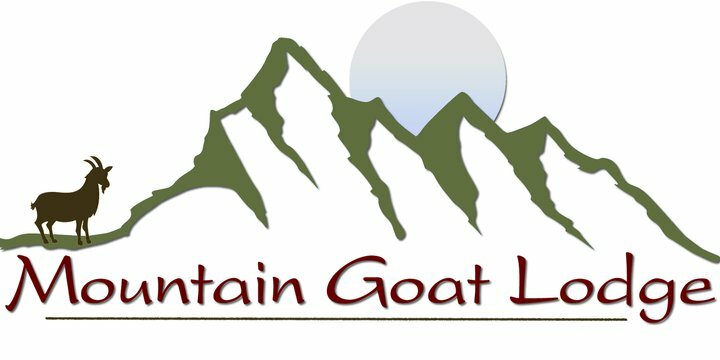 If you need additional parking for an extra vehicle, you may park it out at our place, the Mountain Goat Lodge (9582 US HWY 285). Washer/Dryer – this is a combination washer and dryer – clothes will go directly from the wash cycle to the dryer cycle! The entire cycle takes 3 ½ hours so plan accordingly, and make sure to wait until the entire cycle cools down before the door will reopen. City noise ordinance aims for quiet hours from 10pm-7am. The SMART TV is programed with our NETFLIX account. (No other channels are available). Simply turn on the TV remote, then use the other remote and push NETFLIX to watch. You may also use the Blueray DVD player. At this time we do not subscribe to regular television channels. Please turn off lights and A/C when leaving for the day. You do not need to strip the bed or gather the towels. You may dump the trash and recycling behind the building in the dumpster if you like. To lock the door, just push the top button and turn the deadbolt lever. The Bike Rack in the foyer is for everyone’s use. The Deck in the rear of the building is for everyone’s use. Visiting the farm: Annex guests are always welcome to the Mountain Goat Lodge Dairy Goat Farm. 9582 US HWY 285. We have lots to see and experience – especially during Baby Goat season (Mar – Sep). You don’t need to call ahead, just stop by. If you want to take a class or have a formal tour, call ahead at 719 539 7173. ITEMS LEFT BEHIND: We are not responsible for items left behind in the unit. Please contact us and pay for postage and we will make every attempt to find your item and ship it to you through USPS. While we would never insist on risking your safety to get here, COLORADO does get it's share of winter weather. Our cancellation policy will be upheld UNLESS the Department of Transportation closes the routes between your starting point and our town. We will check the DOT website and keep abreast of the latest road closures. Generally speaking HWY 285 and HWY 50 are always open and snowplowed constantly during the winter. Please use caution, drive slowly, we recommend a 4-wheel drive, heavier vehicle to come through the mountain passes. Our lodge is just a bit off the highway so access is never a problem. Children are welcome with an accompanying adult. Children age 1 and under stay free. Pets are welcome. Unlike many hotels & motels that offer a designated pet-friendly room which features a stinky, stained-carpet room to which guests and their dogs are relegated Mountain Goat Lodge has raised the bar in defining pet friendly accommodations. We also do not have a weight limit for your pets. As much as we love our guests' pets and our own, we also love a clean lodge. Our clean team insures that each room meets the high cleanliness standards we set before our next guests arrive. All of our rooms are pet friendly! While we realize that there are guests who potentially won't stay with us due to extreme allergies to pet dander and/or aversion to animals, that's a small price to pay for all of the wonderful guests that come to us in large part because of our pet policy. We also have a fenced half-acre, off-leash area, which is ideal for ball throwing and general goofing off. All pets must be owner-chaperoned while in this area. $20 fee per night per dog, which includes a pet treats, water bowl, and dog bed.